I was dripping wet, both on the outside, from the rain, as well as on the inside from sweating. Warm and wet it’s not as good when you’re on a bike, as it might sound. I had to wait for some time until the border was opened for business (so unlike the real me, always late) but everyone around was friendly and chatty. Soon after the gates were finally opened and I got to experience the first full blown customs: all luggage was checked (via X-ray scanner) and I got plenty of questions about any possible connection with Armenia. Indeed, the Azeri people have an old conflict with Armenia and any relation is really frown upon. Luckily they did not checked my GPS, nor my phone – as of course I had maps of Armenia already loaded, for the way back :). Eventually I was clear out of the customs, the rain still going strong and with some 500+ Km to go. Soon after the border, just as I’ve managed to escape the rain, I got my first police stop. As I was slightly speeding, I was pretty sure it will turn into a long haggle, but instead I was very warmly greeted and welcomed to Azerbaijan by the police. They have even asked me what can they do to help – I have replied that they should somehow stop the rain and everyone started laughing :D. So I was back on my way, with yet another big grin on my face – they didn’t even asked to see my papers. And than he rephrased it, using different words, different gestures and mimic, until I did finally “ponimayu“. It was just amazing to see so much determination to simply communicate. Really wonderful. Soon after the village stop the gravel finally ended and I was back on tarmac, but I could still hear strange metallic noises from the bike… Que in the second hardware failure, as looking down I saw one of the auxiliary lights dangling happy around the fork leg. Quick stop, on the side of the road, with nothing visible for miles, just the road and fields all around me. Just as I was pondering on the situation and what to do, as the mounting “cage” of the projector was ripped from the fork bolt, due to bad road vibrations, I hear a voice from behind me, coming from where a few seconds ago was just an empty field: “Problem?”. It turns out it was a pretty skilled mechanic who in a few minutes managed to mount again my auxiliary light back in place. All this very quick, very efficient and with just a “take care” in the end, not a single indication that he was expecting anything in return other than maybe just a thank you. Do I need to mention that there was no real common language? “Spaseebo“, my dear friend. 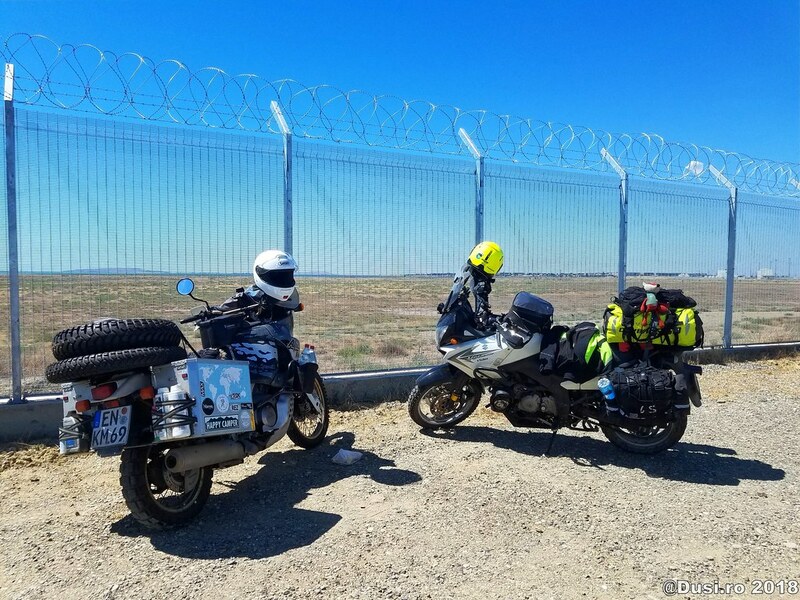 After the bad and slow gravel road, as well as the unplanned pit-stop, I was a bit on fast-forward, so I took the main highway (between Tbilisi and Baku) for a while – only to get bored soon after. As I have stopped for a very tasty shashlik, the Maps.Me turned out to be the savior: I have re-routed my plan via Agsu and, little did I knew at the time, it was to be the highlight of the day. Between Agsu and Muganli really is one of the best roads in the/my world for riding: lots and lots of twisties, fast and slow, perfect asphalt, you name it. I was happy as a puppy and enjoyed every last one of those :D.
Not long after this part, just as I was approaching Baku, the scenery changed completely: desert and steppe all around, nothing green, more than enough to feel like I was way away from home. This really was like nowhere in mainland Europe, I was already in Central Asia. The only thing that was missing were the camels, but I’ll see plenty of those pretty soon as well (oooops, spoiler 🙂 ). Soon after I was already in Baku, already too late to make any plans for visiting the city that night. So I went straight to the hostel, relaxed, confident that I will have plenty of time to see the city during the next days, as I will be waiting for the ferry (hint: I will not…). 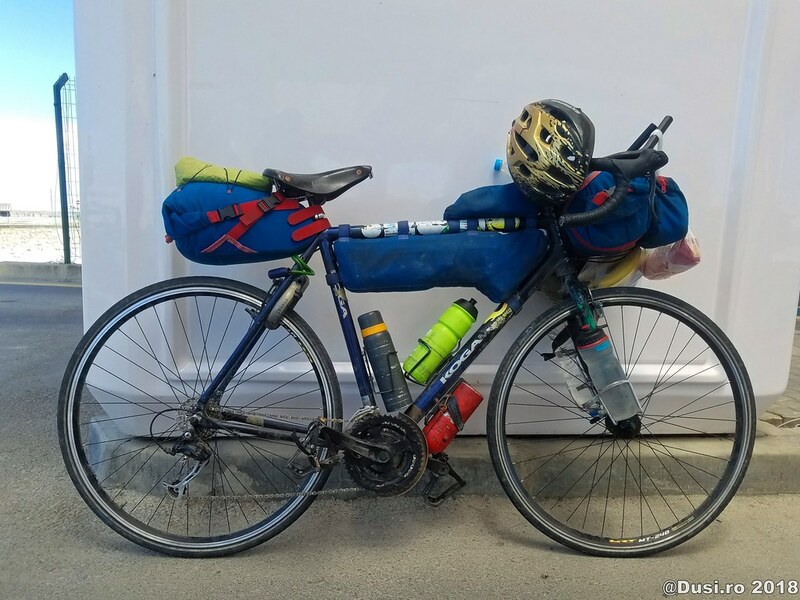 The next day was scheduled for the bike service, to change the engine oil and filter, clean the chain and do an overall checkup on the bike – the hard part of the journey was still ahead of me, not behind. 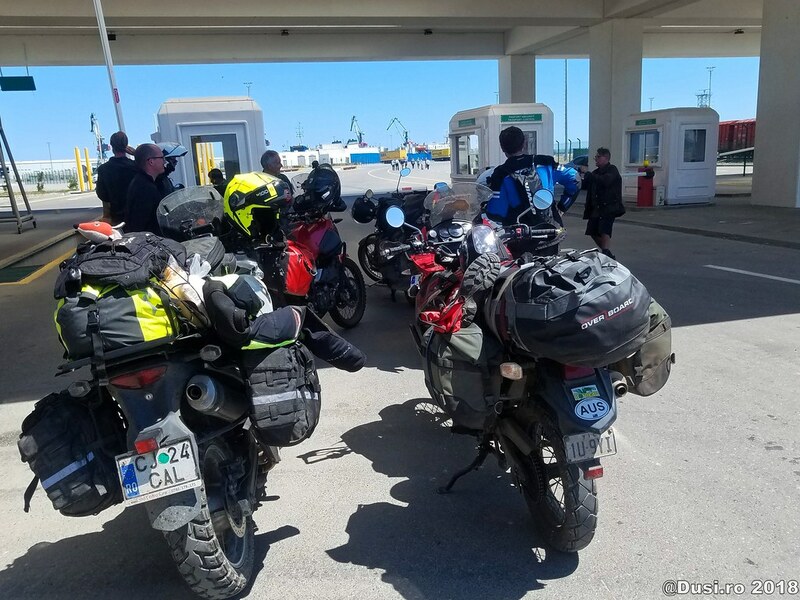 So, early(ish) in the morning, I jumped on the bike, left most of the luggage at home, as I had to strip the bike for the service, and went to meet the service guys at MotoPro Baku, with whom I was already in contact. The service they have provided was way more than I was hoping for and I was really pleased to see my bike pampered after I have abused it all the way so far. While at the service I have asked Alex, the mechanic, a Russian speaker, to call the ferry port in Alat and check for any schedules, but there was no answer, even though we have really insisted. 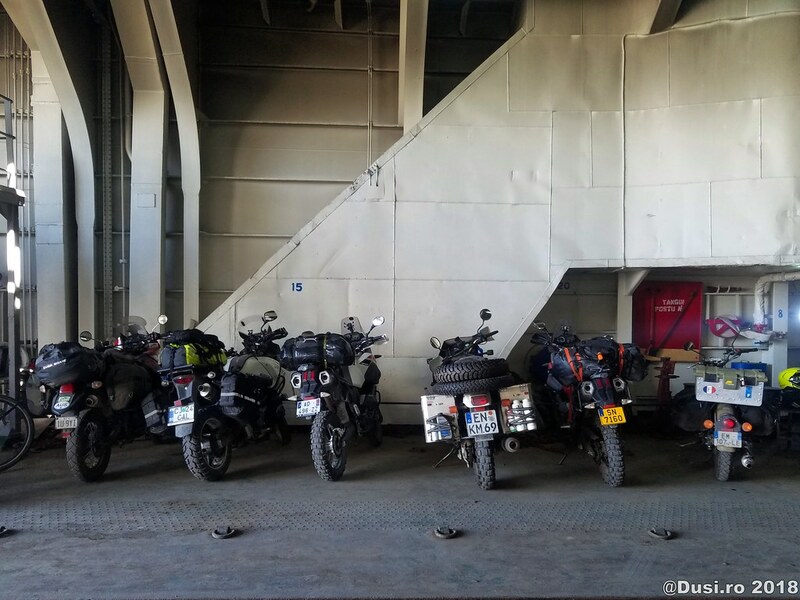 So, happy that I had the bike in great shape again, I have spontaneously decided to just go to the port in a rush, after all it was only 80 Km away from Baku. Which I did, only to reach the port and find out that it was supposed to be a ferry departing on the same night or tomorrow morning at the latest. I was sooooo glad, especially since some of the bikers that I’ve met in the port were waiting there for almost a week. Than I have realized that my hopes to actually visit Baku were out of the window – but hey, on my way back I was supposed to come again through the same port, so goodbye Baku, hope to see you soon :D.
Short side note: In my earlier spontaneous decision to ride to the ferry port I have managed to forget that all my papers (except the passport) were at the hostel – so I have ended up riding 150+ Km with no papers, in a country that is choke full of police – yey me, right? Luckily no one stopped me, so I rushed back to the hostel (which was paid for two nights already), grabbed my papers and luggage and back to the ferry. Only to have to camp in the port compound, just before the customs, for one more night. The ferry would not leave the port until the next evening. 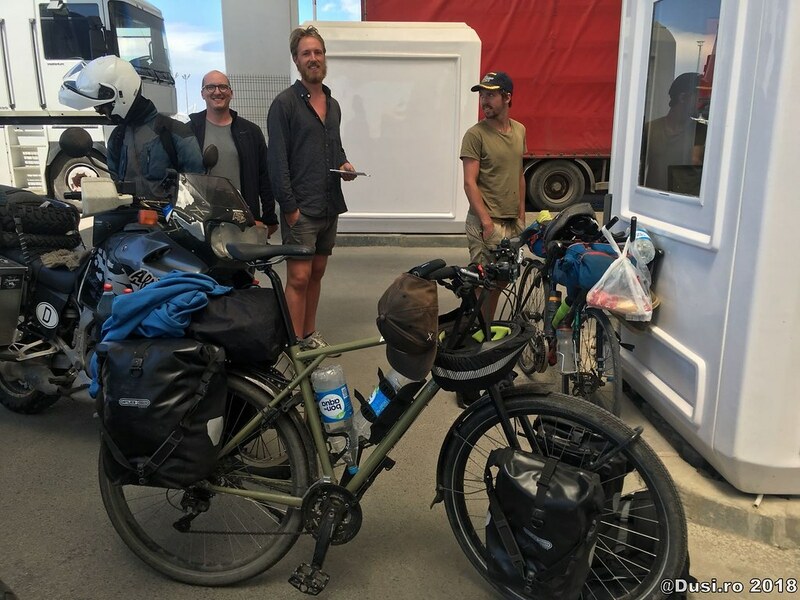 But there was not a single trace of doubt, as I was finally in the company of other riders and travelers, two of them who were actually my hostel neighbors but we have managed not to meet there. And some who will remain in close contact and, little did I know at that time, some with whom I will end up meeting again and again while on the road. But that’s still in the future to come, the last of Azerbaijan was the ferry gate, closing in the evening of the next day. And a epic crossing of the Caspian Sea was soon to follow :).